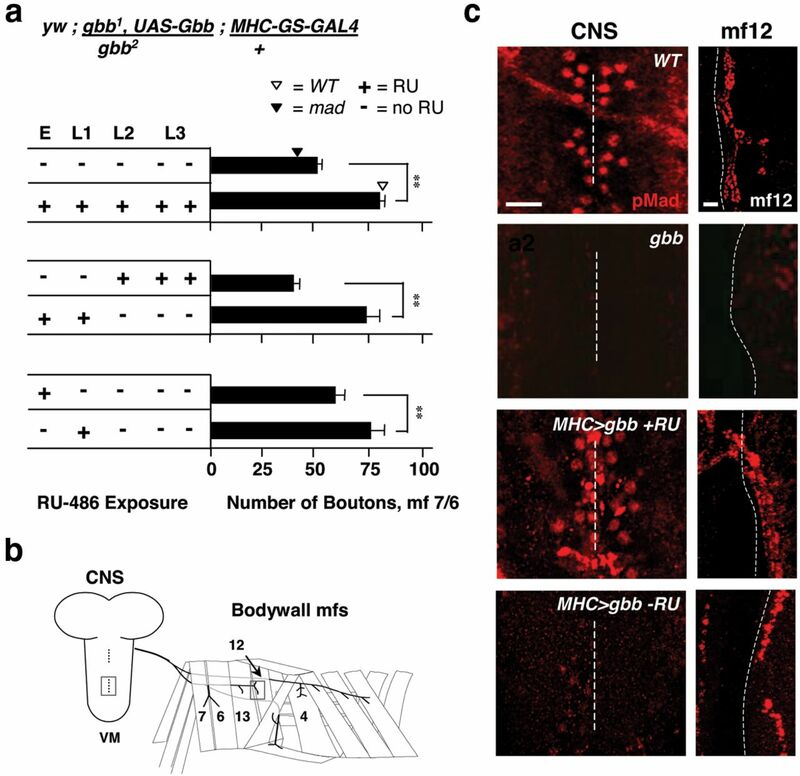 At the Drosophila neuromuscular junction (NMJ), the loss of retrograde, trans-synaptic BMP signaling causes motoneuron terminals to have fewer synaptic boutons, whereas increased neuronal activity results in a larger synapse with more boutons. Here, we show that an early and transient BMP signal is necessary and sufficient for NMJ growth as well as for activity-dependent synaptic plasticity. This early critical period was revealed by the temporally controlled suppression of Mad, the SMAD1 transcriptional regulator. Similar results were found by genetic rescue tests involving the BMP4/5/6 ligand Glass bottom boat (Gbb) in muscle, and alternatively the type II BMP receptor Wishful Thinking (Wit) in the motoneuron. These observations support a model where the muscle signals back to the innervating motoneuron's nucleus to activate presynaptic programs necessary for synaptic growth and activity-dependent plasticity. Molecular genetic gain- and loss-of-function studies show that genes involved in NMJ growth and plasticity, including the adenylyl cyclase Rutabaga, the Ig-CAM Fasciclin II, the transcription factor AP-1 (Fos/Jun), and the adhesion protein Neurexin, all depend critically on the canonical BMP pathway for their effects. By contrast, elevated expression of Lar, a receptor protein tyrosine phosphatase found to be necessary for activity-dependent plasticity, rescued the phenotypes associated with the loss of Mad signaling. We also find that synaptic structure and function develop using genetically separable, BMP-dependent mechanisms. Although synaptic growth depended on Lar and the early, transient BMP signal, the maturation of neurotransmitter release was independent of Lar and required later, ongoing BMP signaling. Growth factors released from postsynaptic target cells can act in a retrograde fashion to influence the development and function of presynaptic terminals (Poo, 2001; Hensch, 2004). Bone morphogenetic proteins (BMPs) are retrograde, trans-synaptic signals that are widely expressed within the developing nervous system (Zhang et al., 1998; Augsburger et al., 1999; Ming et al., 2002) and affect presynaptic growth and neurotransmission both centrally and at neuromuscular junctions (NMJ) (Baines, 2004; Marqués, 2005; Xiao et al., 2013). For example, Drosophila mutations affecting BMP signaling suppress the dramatic increase in NMJ size and strength that normally occurs over 4 d of development (Keshishian et al., 1993; Zito et al., 1999; Aberle et al., 2002; Marqués et al., 2002; McCabe et al., 2003; Rawson et al., 2003; Eaton and Davis, 2005; Goold and Davis, 2007). However, we do not yet know when BMP signaling exerts its effects. Does BMP signaling permit synapse maturation before the robust growth of the NMJ or does it direct synapse development in an on-going manner depending on the level of synaptic drive? Two downstream BMP effectors have distinct roles in the structural and functional development of the NMJ (Ball et al., 2010; Kim and Marqués, 2012). Expression of the guanine-nucleotide exchange factor Trio partially rescues synaptic growth in BMP pathway mutants, without rescue of synaptic physiology (Ball et al., 2010). By contrast, Twit, a Ly6 neurotoxin-like molecule, partially rescues spontaneous neurotransmission with no rescue of NMJ growth (Kim and Marqués, 2012). These observations suggest that distinct sets of effectors may regulate NMJ growth and function. Some of these players might include mechanisms of activity-dependent NMJ plasticity, such as cAMP signaling, the transcriptional regulators AP-1 and CREB, or adhesion molecules, such as the IgCAM Fasciclin-2 (Fas-2) and Neurexin (Ganetzky and Wu, 1983; Budnik et al., 1990; Zhong et al., 1992; Davis et al., 1996; Schuster et al., 1996b; Davis and Goodman, 1998; Cheung et al., 1999; Shayan and Atwood, 2000; Sanyal et al., 2002; Sigrist et al., 2003; Zhong and Wu, 2004; Ashley et al., 2005). However, a role for BMP signaling in synaptic plasticity and its affects on these molecular systems remain largely uncharacterized. Here, we show that NMJ growth and its modulation by activity require an early and transient BMP signal before the robust expansion of the NMJ, whereas retrograde control of NMJ function starts early and requires continuous BMP signaling throughout development. We also find that the receptor protein tyrosine phosphatase Lar, a molecule that regulates NMJ size, rescues the structural changes associated with BMP loss of function and the ability to grow in response to increased activity but does not rescue the physiological phenotypes. Our observations therefore indicate that two genetically separable BMP-dependent mechanisms regulate NMJ structure and function, both of which are initiated by a permissive “go” signal sent to the innervating neuron's nucleus. All stocks were raised at 22°C with Canton S as the wild-type (WT). The following null or strong hypomorphic alleles used in this study include the following: witA12, witB11, witG15, gbb1, gbb2, mad1, and mad12 from K. Wharton (Brown University, Providence, RI), M. O'Connor and S. Selleck (University of Minnesota, Minneapolis, MN), and the Bloomington Stock Center (Bloomington, IN). The deficiency Df(3)LC175 st (from M. O'Connor) spans the wit gene and was used to verify a role for Wit in NMJ plasticity. Gain-of-function experiments were performed by the presynaptic expression of constitutively active type I BMP/TGF-β receptors (yw; UAS-tkvACT and yw; UAS-saxACT; from D. Allen, University of British Columbia, Vancouver, British Columbia, Canada). The activity of TkvACT and SaxACT was verified by expressing each in developing wing discs (using the w, A9-GAL4 driver from K. O'Connor-Giles, University of Wisconsin, Madison, WI), which resulted in wing expansion defects as previously described for BMP gain-of-function manipulations (Haerry et al., 1998). Transgenes were expressed pan-neuronally using mifepristone (RU-486)-inducible GeneSwitch (GS) GAL4 drivers that express transgenes in all neurons (ELAV-GS-GAL4) and the body wall musculature (MHC-GS-GAL4) (Osterwalder et al., 2001). The TARGET temperature-conditional expression system (McGuire et al., 2003, 2004) was used to rescue wit mutations pan-neuronally with the ELAVC155-GAL4 driver expressing Wit transgenes (UAS-Wit-GFP and UAS-WitΔTFlag1x, from M. O'Connor, University of Minnesota, Minneapolis, MN). Neuronal excitability was elevated by either crossing in the K+ channel mutations eag1 Sh120 (Budnik et al., 1990) or by rearing animals at 30°C (Peng et al., 2007). Both of these manipulations increase TTX-sensitive spontaneous activity, stimulate NMJ growth, increase the complexity of synaptic arborizations, and rely on cAMP signaling for their effects on growth (Sigrist et al., 2003; Zhong and Wu, 2004; Peng et al., 2007). An intermediate elevation in activity was achieved using a null Sh mutation (ShM) or by rearing larvae at 25°C (Zhong and Wu, 2004). For the Mad1 rescue experiments, we used UAS-dnrxf1, w (from M. Bhat, University of North Carolina, Chapel Hill, NC), w; UAS-Fos; UAS-Jun (from S. Sanyal, Emory University, Atlanta, GA), and w; UAS-Rut+ (from the Bloomington Stock Center, Bloomington, IN). The Lar13.2/CyO-GFP, Lar5.5FRT/CyO-GFP, w;; P[w+mc=UAS.Lar.K]P4B, and yw;; P+29[w+,UAS-Lar-C1638S+C1929S] stocks were from D.V.V. and the Bloomington Stock Center. 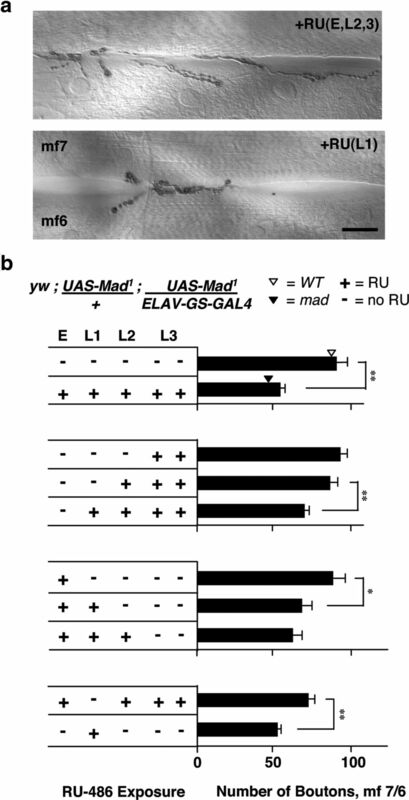 UAS-Mad1 as a dominant-negative effector. The UAS-Mad1 transgene is derived from the Mad1 dominant allele. It encodes a mutant protein resulting from a base pair substitution in the conserved MH1 DNA-binding sequence of Mad while retaining the sites required for phosphorylation-dependent regulation and for binding to the co-SMAD Medea (Takaesu et al., 2005). Expression of Mad1 shows dominant-negative phenotypes during wing and peptidergic neuron development (Takaesu et al., 2005; Eade and Allan, 2009). The dominant-negative activity is likely to result from binding the co-SMAD Medea without being able to promote transcription, thus competing with WT Mad for its most common binding partner. In the embryonic and first larval instar CNS, expression of the neuropeptide FMRFamide (FMRFa) is regulated by Mad, as wit mutations or Mad1 expression effectively suppress FMRFa transcription (D. Allan, personal communication; Allan et al., 2003; Eade and Allan, 2009). To assess how effectively Mad1 suppressed transcription during NMJ growth, we expressed Mad1 pan-neuronally with the ELAV-GS-GAL4 driver and measured FMRFa transcript in third instar larval brain using qPCR. Mad1 again reduced FMRFa levels to those of wit mutations: wit (witA12/witB11) and Mad1 reduced transcript levels ∼3.5-fold (WT, 0.00402; wit, 0.00112, p = 0.005; Mad1 without RU-486 induction, 0.00967; Mad1 with RU-486 induction 0.00275, p = 0.003). Presynaptic expression of Mad1 phenocopies the synaptic growth and most of the physiological defects observed in mad mutants (Rawson et al., 2003; McCabe et al., 2004) (see Figs. 1 and 9). The physiological phenotypes are likely due to ultrastructural defects in the synaptic release machinery, which in wit mutants include a decrease in the number and increase in size of active zones (Aberle et al., 2002; Marqués et al., 2002). We found that presynaptic Mad1 expression similarly reduced the number but also aberrantly increased the size of active zones, as scored by immunolabeling of the active zone-associated protein Bruchpilot (Brp) (see Fig. 10). These results show that the expression of Mad1 faithfully recapitulated the phenotypes associated with various BMP signaling mutations. Staging larval development and the temporal control of transgene expression. Newly deposited eggs were collected during 2 h time-windows at 25°C to obtain larvae at specific developmental stages. Larval development was further synchronized by collecting hatchling first instar (L1) larvae every 2 h. Spiracle appearance, body size, and time were used to identify early second instar (L2) and third instar (L3) animals. For experiments using GS drivers, larvae and adults were cultured on media containing 5 μg/ml of the RU-486 steroid (Sigma), whereas control animals were raised on media lacking RU-486. Transgene expression in embryos was induced by exposing the parental flies to RU-486 media for 4 d before egg collection. Some experiments included a yeast paste containing 50 μg/ml RU-486 to ensure strong induction. To induce expression at specific developmental stages, larvae were raised on agarose plates containing yeast paste either with or without 50 μg/ml RU-486 and then transferred to normal or RU-486 containing food vials for the remainder of development. No significant difference in larval locomotion, size, or NMJ morphology was observed between animals grown in food vials versus yeast-containing agarose plates. 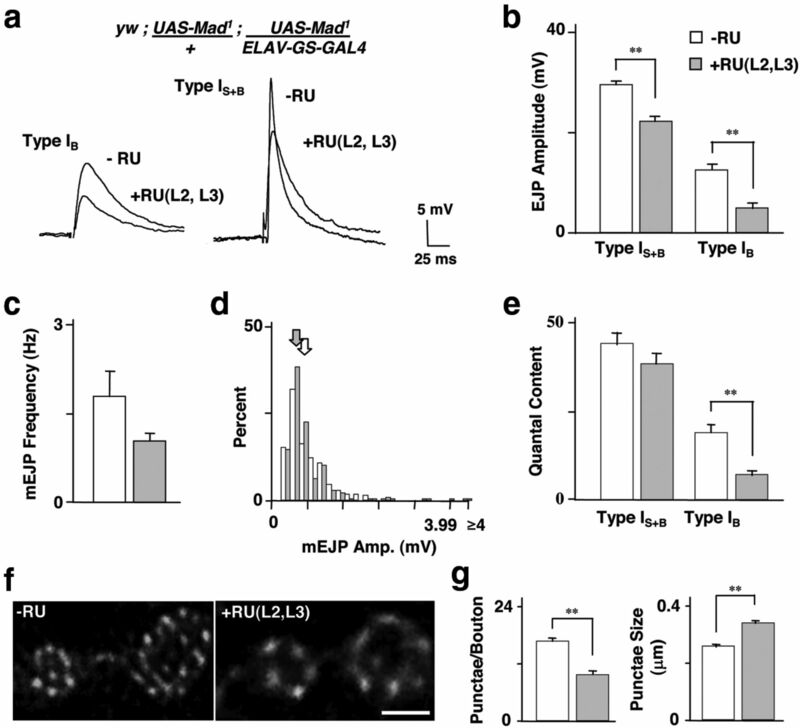 ELAV-GS-GAL4 induces detectable expression of GFP in the larval CNS some 5 h after exposure to RU-486 in food, with maximal expression after 12 h, as determined by Western blot (Osterwalder et al., 2001). The onset of transgene expression contrasts with a slower time course for the loss of expression, likely because of transgene perdurance and the clearance of RU-486. We used the TARGET system of temperature-controlled transgene expression to control Wit expression (McGuire et al., 2003, 2004). Animals were maintained at either 18°C to suppress Wit expression or at 30°C to induce expression (through the relief of GAL80ts-mediated inhibition of GAL4). Larval development is faster at 30°C than at 18°C, so we monitored both spiracle shape and body size to accurately confirm developmental stages in synchronized larval populations. The onset and termination of transgene expression with TARGET may be faster than with GS as there is no time involved for ingestion and clearance of the steroid-inducing agent. Although transgene expression kinetics may be faster with TARGET, there is a robust temperature dependence of locomotion and NMJ activity, with high temperature increasing the size of the NMJ (Sigrist et al., 2003; Zhong and Wu, 2004). We took advantage of this effect to examine activity-dependent synaptic plasticity in wit mutants during the presence of an induced transgene. Crawling third instar larvae were filleted in low Ca2+ (1 mm) saline, as previously described (Osterwalder et al., 2001), and fixed in 4% PFA (60 min at room temperature). All antibodies were prepared in a solution of 1% BSA diluted in PBS with Triton X-100 detergent (TBS: 20 mm NaH2PO4, 150 mm NaCl, 0.3% Triton X-100, adjusted to pH 7.3). Tissues were incubated with agitation on an orbital shaker. NMJs were labeled with goat anti-HRP antibody overnight at 4°C (1:200, Cappel Laboratories), washed in TBS for 1 h, and then stained with peroxidase-conjugated donkey anti-goat IgG for 2–4 h at room temperature (1:200, Jackson ImmunoResearch Laboratories). NMJs were visualized with 0.05% DAB (Polysciences) in the presence of 0.003% H2O2. The antibody specific to phosphorylated Mad was diluted 1:200 (pMad, PS1, rabbit; a gift from P. ten Dijke, University of Leiden, Leiden, The Netherlands). pMad was visualized by combining a fluorescent secondary diluted 1:1000 (goat anti-rabbit AlexaFluor-568, Invitrogen) with a fluorescent tertiary antibody, diluted 1:1000 (donkey anti-goat AlexaFluor-568, Invitrogen). The active zone-associated protein Brp was immunolabeled using a mouse NC82 Mab (1:100, Developmental Studies Hybridoma Bank) and goat anti-mouse Alexa-568 (1:1000, Invitrogen). DAB-stained preparations were mounted in glycerol, and fluorescent preparations were mounted using the Slowfade Antifade Kit from Invitrogen. For fluorescent imaging, 1 μm optical sections were collected on either a Bio-Rad 1024 confocal system with a 40× Planapochromat 1.0 NA objective or a Zeiss LSM 510 with a 40× Planapochromat 1.3 NA objective. Comparative pMad and Brp staining within the third instar larval brain and at the muscle fiber (mf) 12 NMJ was performed by labeling 3 or 4 animals of each genotype or condition in the same well, mounting them adjacently, and visualizing the fixed preparations using the same acquisition parameters. Deconvolution of the Brp images was performed with Imaris Autoquant (Bitplane AG), and all measurements were performed in Adobe Photoshop. NMJ size was quantified from anti–HRP-labeled and DAB-stained NMJs using bright-field imaging. All data were taken from muscles in abdominal segments A3 and A4. Data from mfs 7 and 6 are shown, but similar phenotypes were observed on a variety of muscles, including mfs 13, 12, 5, 4, and 1. The degree of motoneuron branching was quantified on mfs 13 and 12 by scoring the proportion of NMJs whose highest order branch was either a primary, secondary, or tertiary (or greater) process. An NMJ branch was defined as a motoneuron process with 3 or more synaptic boutons. All synaptic boutons on a given muscle were scored and classified by bouton type (Ruiz-Cañada and Budnik, 2006). The size of muscle fibers across all control conditions and for the Mad1-expressing animals did not differ significantly. Muscles in gbb, wit, and mad mutants were smaller than their controls, yet normalization to muscle surface area had no effect on the significance of the data or conclusions. The data are presented as the absolute number of boutons. Bouton counts are reported as mean ± SEM and analyzed for significance using a one-way ANOVA followed by a post hoc analysis with two tailed t tests. Third instar larvae were dissected and recorded with 3M KCl sharp microelectrodes (35–45 MΩ resistance) as previously described (Mosca et al., 2005). The bath saline contained 140 mm NaCl, 5 mm KCl, 1 mm CaCl2, 4 mm NaHCO3, 6 mm MgCl2, 5 mm TES, 5 mm Trehalose, 50 mm sucrose, and pH'd to 7.2 with NaOH. Stimulus protocols were delivered with suction electrodes to a small portion of the compound nerve when recording from mf 6 or to the axonal segment between mf 13 and mf 12 when recording from mf 12. All recordings were taken from abdominal segments A3 and A4. PClamp 9.0 software (Molecular Devices) was used to implement stimulus protocols and to record signals, which were collected at 10 kHz with a Dagan 8500 two-electrode voltage-clamp amplifier. The signals were then filtered using a Gaussian filter with 3 kHz cutoff. All recordings were performed at room temperature, ∼22°C. Quantal content was computed as the mean excitatory junctional potentials (EJPs)/mean miniature EJPs (mEJPs) for synaptic potentials evoked from the large (type IB) terminal and the combined large and small (type IS) terminals. RNA was isolated from the CNS of mature third instar WT, witA12/witB11, and yw; UAS-Mad1; ELAV-GS-GAL4 larvae grown in the presence or absence of RU-486. Dissected brains were rinsed with bath saline, quickly frozen in Trizol (Invitrogen), and homogenized in Trizol before RNA purification with standard procedures. cDNA was generated using 1 μg of total RNA, an oligo (dT)18 primer, and Superscript II (Invitrogen). Transcript levels were quantified by qPCR performed in a 10 μl reaction volume with a LifeTech (ABI) 7900 using a Power SYBR Green Real-time PCR Master Mix (Applied Biosystems). Reactions were run in triplicate with three biological replicates and average fluorescence Ct values were obtained. Quantification of the transcript level of genes was accomplished using the relative quantification method (Livak and Schmittgen, 2001). qPCR primers unique to Lar and FmrF were selected and list as follows: Lar F: 5′-TCTCTCAAGGATGGCTTCCTGCAA-3′, Lar R: 5′-TTGAGTTCTCAGCCACACACTCGT3′; FmrF F: 5′-TATGGATCGGTATGGCAGAGA-3′, FmrF R: 5′-TCCAAAGCAGGACTTCATGAG-3′. To normalize the results, ELAV, and RpS3 were used as endogenous reference primers: ELAV-F: 5′-ACCAAAGTCCTGGACAACCGAAGA-3′, ELAV-R: 5′-CCTTGATGTCACGCACGATT-3′; RpS3-F: 5′-TTGCTATGGTGTGCTCCGCTACAT-3′, RpS3 R: 5′-ACGAATTTCATCGACTTGGCACGC-3′. Secretion of the BMP 4/5/6 homolog Glass bottom boat (Gbb) from postsynaptic muscle fibers stimulates presynaptic growth and development at the Drosophila NMJ. Gbb activates a presynaptic receptor complex containing the type II BMP receptor Wishful thinking (Wit), which is endocytosed and retrogradely transported to the motoneuron nucleus (Smith et al., 2012). Wit and its receptor complex then phosphorylate Mad, the SMAD1 transcription factor (pMad). Loss of function gbb, wit, and mad mutants each have approximately one-half of the WT number of synaptic boutons and lack normal pMad labeling in the motoneuron nucleus and at synaptic boutons (Aberle et al., 2002; Marqués et al., 2002; McCabe et al., 2003, 2004; Keshishian and Kim, 2004). NMJ growth and pMad localization can be restored in the corresponding mutants by presynaptic expression of either Wit or Mad, or by postsynaptic expression of Gbb (McCabe et al., 2003, 2004). However, pMad localizes to motoneuron nuclei during all stages of larval development (embryo, first, second, and third larval instars; E, L1-L3), yet the most robust NMJ growth occurs 2 d after synapse formation (during L2 and L3) (Keshishian et al., 1993; Broadie and Bate, 1993; Zito et al., 1999; Collins et al., 2006; Wang et al., 2007). We addressed the discrepancy between nuclear pMad localization and NMJ growth by controlling the expression of Mad1, the protein encoded by the mad1 mutation. The Mad1 protein has a single residue change within its DNA-binding sequence (Takaesu et al., 2005), causing it to act as a dominant-negative and to phenocopy BMP loss of function mutations (see Materials and Methods) (Allan et al., 2003; Takaesu et al., 2005; Eade and Allan, 2009). To control the timing of Mad1 expression, we used the GeneSwitch GAL4 system (GS-GAL4), a modification of the GAL4-UAS system where a steroid-inducible fusion protein of GAL4 and the human progesterone receptor (GS-GAL4) are used to express UAS transgenes. GS-GAL4 driver lines are activated when RU-486 (mifepristone) is provided in the food (Osterwalder et al., 2001). The pan-neural ELAV-GS-GAL4 induces GFP expression in the CNS after larvae have been exposed to RU-486 for 5 h, with peak expression occurring 12 h after the start of feeding (Osterwalder et al., 2001). When Mad1 was expressed throughout embryonic and larval development (see Materials and Methods), we observed a strong suppression of synaptic growth, resulting in NMJs that were similar in size to those observed in mad mutants (mfs 7 and 6, WT control: 84.2 ± 4.5, mad1/mad12: 43.5 ± 4.0, p < 10−5; Mad1 driven by ELAV-GS-GAL4 (ELAV > Mad1 +RU): 52.7 ± 2.8; p = 0.08). We also observed a strong effect on NMJ branching. The percentage of synapses onto mfs 12 and 13 with tertiary or higher branch order was significantly reduced (WT = 48%, mad1/mad12 = 7%, ELAV > Mad1 +RU = 14%; WT vs mad1/mad12, p = 0.007; WT vs ELAV > Mad1 +RU, p = 0.003; mad1/mad12 vs ELAV > Mad1 +RU, p = 0.22). By contrast, the overexpression of a single copy of WT Mad in presynaptic motoneurons did not have any observable effects on NMJ growth (data not shown). Having found that pan-neural Mad1 induction throughout embryonic and larval development effectively reduces NMJ size (Fig. 1b, first two bars), we systematically presented RU-486 to activate Mad1 at different stages of development to estimate when Mad activity is required for NMJ growth. We first examined the effect of presenting RU-486 at successively earlier stages of larval development (Fig. 1b, bars 3–5). No significant effect was seen when RU-486 was presented during the last larval instar (L3; Fig. 1b, bar 3), or in both L2 and L3 (Fig. 1b, bar 4), a period of 3 d when most bouton addition takes place (Keshishian et al., 1993; Zito et al., 1999). By contrast, presenting the inducing agent throughout larval development (L1-L3) resulted in a significant reduction in NMJ size (Fig. 1b, bar 5). We next examined the effect of presenting the inducing agent at successively later stages of development (Fig. 1b, bars 6–8). When RU-486 induction was limited to the embryonic stage (Fig. 1b, bar 6; see also Materials and Methods), the NMJ was of normal size. By contrast, a suppression of growth occurred when induction was also provided during L1 (Fig. 1b, bar 7). Continued exposure to the inducing agent through L2 did not further suppress synaptic growth (Fig. 1b, bar 8). NMJ growth requires an early period of Mad signaling during the first larval instar (L1). a, NMJs on mf 7/6 from staged third instar larvae bearing an RU-486-inducible dominant-negative Mad1 transgene driven in neurons (yw; UAS-Mad1/+; UAS-Mad1/ELAV-GS-GAL4). See Figure 2b for a schematic diagram of the body wall musculature. Top, Normal-sized NMJ of an animal where expression of Mad1 was induced at all stages of development except L1 [+RU (E, L2, L3)]. Bottom, Smaller NMJ of an animal where expression of Mad1 was induced only during the L1 stage [+RU (L1)]. Scale bar, 20 μm. b, The number of synaptic boutons on muscle fibers mf 7/6 from staged third instar larvae bearing the RU-486-inducible dominant-negative Mad1 transgene. The developmental stages are indicated at the top (the E, L1, and L2 stages each last 1 d, and the L3 stage lasts 2 d). +, induction with RU-486; −, no induction. The top two bars show the effects of Mad1 induction throughout development compared with the effect of no induction. For reference, the average number of boutons observed in either WT controls (white arrowhead) or for the mad1/mad12 heteroallelic mutant (mad; black arrowhead) are indicated on the bars. The second group of three bars shows the effect of inducing expression of the Mad1 transgene at successively earlier stages of development. The third group of three bars shows the effect of inducing expression of the Mad1 transgene at successively later stages. The final two bars compare the effect of inducing expression at all times except L1, or alternatively inducing expression only at L1. Images of the NMJs from these last two experiments are shown in a. *p < 0.05. **p < 0.005. These results suggest that RU-486 feeding during L1, to inhibit Mad function during that period of development, had a strong effect on later NMJ growth. To address this directly, we next exposed animals to the inducing agent during the E, L2, and L3 stages, but not L1 (Fig. 1a, top, b, bar 9) or alternatively, only during L1 (Fig. 1a, bottom, b, bar 10). The results indicate that NMJ growth is strongly suppressed when Mad1 is induced during the L1 stage of larval development, a period that precedes the majority of NMJ growth. Induction at all times before and after that time had minimal effects on growth. These results are consistent with retrograde BMP signaling during L1 promoting NMJ growth over the next 3 d of development. Expression of Gbb in the postsynaptic muscles of gbb mutants can rescue NMJ size (McCabe et al., 2003), yet Gbb released in the CNS strengthens synapses between interneurons and motoneurons (Baines, 2004). Stronger interneuron-motoneuron synapses may also contribute to NMJ growth. We therefore examined whether induction of Gbb expression in muscle during L1 similarly rescued NMJ size. Using an inducible muscle-specific MHC-GS-GAL4 driver, we expressed a WT Gbb transgene (MHC > Gbb +RU) in the muscles of gbb mutants and induced expression using the RU-486 feeding regimen as described above for Mad1. We analyzed synaptic morphology in mature L3 animals and also examined the localization of pMad to assess the activation of presynaptic BMP signaling. Uninduced gbb mutant larvae bearing the inducible transgene (MHC > gbb −RU) had small NMJs, similar in size to heteroallelic gbb mutants (Fig. 2a, bar 1; mfs 7 and 6, MHC > gbb −RU: 50.1 ± 2.8; gbb1/gbb2, denoted by the open arrowhead: 43.3 ± 2.7; p = 0.05). When RU-486 was fed throughout embryonic and larval development to drive expression of Gbb in muscle (MHC > gbb +RU), bouton numbers were fully rescued (Fig. 2a, bar 2, p < 0.005; compare with the filled arrowhead, for WT), and we observed a small, though nonsignificant, increase in motoneuron branching (branching data, WT = 46%, MHC > gbb −RU = 5%, and MHC > gbb +RU = 10%; MHC > gbb −RU vs MHC > gbb +RU, p = 0.38). As was found for the Mad1 expression analysis, RU-486 induction during the L2 and L3 stages failed to restore NMJ size (Fig. 2a, bar 3), whereas induction during E and L1 produced a significant rescue (Fig. 2a, bar 3). The data indicate a critical or sensitive period during early development, before the major NMJ expansion in L2 and L3. This was confirmed by limiting Gbb induction solely to L1 (Fig. 2a, bar 6), whereas induction in the embryo alone failed to restore normal NMJ size (Fig. 2a, bar 5). Phenocritical rescue of gbb mutants indicates that signaling during L1 is sufficient for NMJ growth. a, The number of synaptic boutons on staged, third instar mf 7/6 NMJs in animals mutant for the BMP ligand gbb and bearing an RU-486-inducible Gbb transgene driven in muscle fibers (w; gbb1, UAS-gbb/gbb2; MHC-GS-GAL4/+). +, induction with RU-486; −, no induction. The top two bars show the effects of Gbb induction throughout development compared with the effect of no induction. For reference, the average number of boutons observed in either WT controls (white arrowhead) or for the gbb1/gbb2 mutations (gbb; black arrowhead) are indicated on the bars. The second pair of bars shows the effect of rescuing the gbb mutants by inducing expression of Gbb in muscle fibers during late stages (L2 and L3) compared with induction at early stages (E and L1). The third pair of bars shows the rescuing effect of inducing expression either in the E or L1 stage. b, Schematic diagram of the larval CNS and key body wall muscle fibers. Boxes represent the approximate locations of the images in c. VM, Ventral midline. c, Immunolabeling of pMad in neuronal nuclei within the ventral ganglion (left column) and at the periphery in synaptic boutons (right column). The top row shows WT labeling; the second row of images is from a gbb mutant (gbb1/gbb2), the third and fourth rows of images are from a gbb larvae carrying a UAS-Gbb transgene (w; gbb1,UAS-gbb1/gbb2; MHC-GS-GAL4/+) either with (third row; MHC > gbb +RU) or without induction (fourth row; MHC > gbb −RU) by RU-486. The synaptic boutons on mf 12 are located to the right of the dashed line. Scale bars: ganglion, 20 μm; synaptic boutons, 10 μm. **p < 0.005. We verified that Gbb expression in muscle was sufficient to activate pMad, as assessed by its localization in the nuclei of motoneurons, where it is involved in gene transcription. We monitored pMad immunofluorescence in WT, gbb mutants, and in gbb mutants whose muscles expressed Gbb (Fig. 2c). In WT third instar larvae, pMad-immunopositive labeling is readily observed within the CNS as well as at NMJ boutons (Fig. 2c, WT; refer to Fig. 2b for the corresponding sampling areas). By contrast gbb1/gbb2 mutant larvae showed barely detectable immunofluorescence at both the central and peripheral sites (Fig. 2c, gbb). Restoring Gbb expression throughout development in muscle restored pMad immunofluorescence to both sites, confirming that the loss of pMad in the mutants results from the loss of Gbb (Fig. 2c, MHC > gbb +RU). We did observe staining at the NMJ in uninduced larvae (Fig. 2c, MHC > gbb −RU), which we suspect results from leakiness of the MHC-GS driver (independent of RU486) that occurs in late third instar (Nicholson et al., 2008). These patterns of labeling are consistent with a model where Gbb, released from muscle, activates BMP signaling at the NMJ where the type I and II receptors (including Wit) reside, and through retrograde mechanisms, leads to the presence of the activated transcription factor in the nuclei of motoneurons. A role for early retrograde BMP signaling was also revealed by examining the phenocritical rescue of wit mutants using a Wit transgene. We used the TARGET system of temperature-dependent (18°C vs 30°C) transgene expression (see Materials and Methods) and ELAV-GAL4 to drive a UAS-Wit-GFP construct in presynaptic motoneurons. An important aspect of these experiments is that the high-temperature rearing required for Wit expression also elevates locomotor and electrical activity, causing NMJs to grow twice the WT size (Sigrist et al., 2003; Zhong and Wu, 2004). This allowed us to simultaneously examine the role of Wit signaling in activity-dependent synaptic plasticity. Control experiments on the WT verified that NMJ size is increased by high temperature (30°C) but is not reduced by low temperature (18°C) (Fig. 3a, bars 1–3). High-temperature rearing also had no effect on NMJ expansion in wit mutants (Fig. 3a, compare bars 4 and 6). Pan-neural induction of the Wit receptor throughout embryonic and larval development effectively restored the enlarged NMJ size (Fig. 3b, compare bars 1 and 2). This indicates that Wit signaling may be required for activity-dependent synaptic growth at the NMJ. The NMJ growth defects caused by wit mutations can be rescued by neuronal expression of Wit during E and L1. a, The effect of rearing temperature (18°C, 22°C, or 30°C throughout development) on the number of synaptic boutons on mf 7/6 in WT third larval instar animals raised at each of the three temperatures (top 3 bars; WT18, WT22, WT30). The fourth bar represents bouton numbers for witB11/witG15 mutant larvae raised at 22°C (wit22). 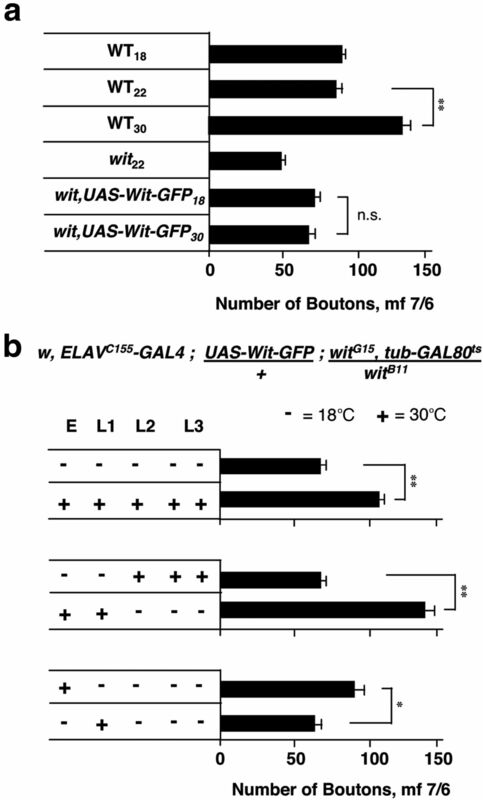 The fifth and sixth bars represent bouton numbers for wit animals raised at either 18°C or 30°C bearing the UAS-Wit-GFP transgene and the temperature-sensitive tub-GAL80ts suppressor of Gal4 activity, but without the Gal4 driver (wit, UAS-Wit-GFP18 and wit, UAS-Wit-GFP30; UAS-Wit-GFP/+; witB11/witG15, tub-GAL80ts). The top 3 bars represent the NMJ expansion associated with high-temperature rearing (30°C); the bottom three bars represents the absence of an expansion in animals possessing a wit mutation. b, NMJ synaptic bouton counts on mf 7/6 in wit mutant larvae with expression of a Wit-GFP transgene induced at various stages of development using the temperature-dependent TARGET system (see Materials and Methods). At 18°C (−), Wit expression is suppressed. At 30°C (+), Wit expression is induced. The top pair of bars compares the effect of no induction of Wit (18°C) to that of induction throughout development (30°C). The second pair of bars compares the effect of late (third bar, L2 and L3) versus early (fourth bar, E and L1) induction. The third pair of bars compares induction only during E (fifth bar) with that of induction during L1 (sixth bar). *p < 0.05. **p < 0.005. n.s., Not significant. Consistent with our results for Mad and Gbb, high-temperature rearing and induction of Wit during L2 and L3 had no effect on NMJ size (Fig. 3b, bar 3). By contrast, induction during E and L1 resulted in enlarged NMJs that were equal in size to synapses in temperature-treated WT animals (compare Fig. 3b, bar 4 with Fig. 3a, bar 3). When we attempted to dissect the early requirement of Wit by inducing receptor expression at either E or L1, we were surprised to find that induction in the embryo resulted in a partial restoration of NMJ growth (Fig. 3b, compare bars 2, 4, and 5), whereas induction in L1 showed no rescue (Fig. 3b, bar 6). One explanation for the apparent embryonic requirement for Wit in contrast to the later L1 requirement for Gbb and Mad could be the time needed for transgene expression, transport, and function. Gbb and Mad1 are both transcribed and translated in close proximity to where they exert their actions: Gbb is expressed by muscle nuclei within a few micrometers of where it is released, and Mad1 is expressed at the motoneuron cell body where it should exert its dominant-negative actions. By contrast, more time may be required to express and transport Wit from the motoneuron cell body to the NMJ in sufficient quantities to mediate BMP signaling during the L1 stage. The above results show that, in addition to normal growth, the activity-dependent expansion of the NMJ may also require BMP signaling. Motoneuron activity is a potent regulator of NMJ development, with increased action potential firing rates leading to a greater number of synaptic boutons and more complex axon branching profiles. This developmental plasticity was first described in hyperexcitable K+ channel double-mutants such as eag Sh, whose motoneurons show robust spontaneous action potential firing that is suppressed by the Na+ channel blocker TTX or by mutations that affect para, the NaV1 voltage-gated Na channel (Ganetzky and Wu, 1982, 1983; Budnik et al., 1990). Similar effects are observed when flies are reared in a high-temperature environment, where locomotor activity and motoneuron firing rates are also enhanced (Sigrist et al., 2003; Zhong and Wu, 2004; Peng et al., 2007). We therefore examined the synapses of eag Sh; gbb and eag Sh;; wit triple mutants, finding small NMJs that resemble those of gbb and wit rather than the expanded synapses of eag Sh (Fig. 4a,b). Bouton numbers at these synapses were half the WT level as assessed on multiple muscles (mfs 6, 7, 12, 13, 5, 4, and 1). Branching profiles on mfs 12 and 13 were correspondingly simple (WT: percentage NMJs with tertiary or higher branch order 48%; eag Sh: 93%; wit: 15%; eag Sh;; wit: 10%; gbb: 30%; and eag Sh; gbb: 8%). Similar results were obtained with eag Sh;; wit over a wit deficiency (Fig. 4a). Using high temperature to increase activity was equally ineffective: the NMJs at 30°C were similar in size to those seen at 22°C (Fig. 4b; WT 30°C: 83%; wit 30°C: 2%; gbb 30°C: 9%). Growth plasticity was partially rescued in wit mutants by a truncated Wit transgene (WitΔC) that lacks noncanonical signaling and causes Wit to signal exclusively through Mad (Fig. 4c; compare the bars 3 and 4, p < 0.05, and bars 2 and 4, p < 0.05) (Eaton and Davis, 2005). This suggests that much of the rescue is taking place through Mad, a view substantiated by the presynaptic expression of Mad1, which blocked the activity-dependent NMJ expansion due to eag Sh and high temperature (Fig. 4c, right). These findings indicate that activity-dependent plasticity at the NMJ requires retrograde BMP signaling through Mad. Canonical BMP signaling is required for the activity-dependent expansion of the NMJ. a, Representative NMJs on mf 7/6 in third instar larvae, illustrating the NMJ expansion associated with eag Sh, and the absence of an eag Sh-dependent expansion in wit mutants. Genotypes: WT, wit (witA12/witBll), eag Sh (eag1Sh120), and eag Sh;; wit (eag1Sh120/Y;; witB11/Df(3L)c175). Scale bar, 25 μm. 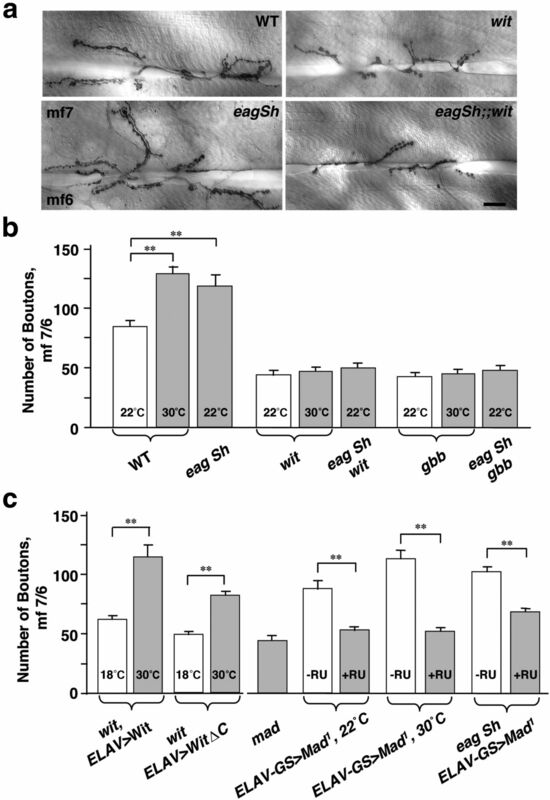 b, The number of synaptic boutons on mf 7/6 of third instar larvae, illustrating the dependence on BMP signaling (revealed by either wit or gbb mutations) for NMJ expansion due to high-temperature rearing or eag Sh-induced neuronal hyperactivity. Data were collected from WT animals reared at 22°C and 30°C, eag Sh reared at 22°C, wit reared at 22°C and 30°C, eag Sh wit (eag1 Sh120/Y;; witB11/witG15), gbb (gbb1/gbb2) reared at 22°C and 30°C, and eag Sh gbb (eag1 Sh120; gbb1/gbb2). c, The dependence on BMP signaling for activity-dependent NMJ expansion, tested by rescue of either wit mutations with a Wit transgenes and by dominant suppression of Mad signaling with the Mad1 transgene. NMJ sizes in control (18°C) and rescued (30°C, wit; ELAV > Wit) wit animals (w, ELAVc155-GAL4/Y; UAS-Wit-GFP/+; witG15, tub-Gal80ts/witB11) and in animals rescued with a Wit transgene lacking its C terminus (wit; ELAV > WitΔC; w, ELAVc155-GAL4/yw, UAS-WitΔTFlag1x;; witG15, tub-Gal80ts/witB11). The number of boutons is also provided for mad (mad1/mad12) mutants and for larvae expressing Mad1 (ELAV-GS > Mad1; +; UAS-Mad1/+; UAS-Mad1/ELAV-GS-GAL4) upon rearing at 22°C and 30°C in the absence (−RU) and presence (+RU) of RU-486. Synaptic size in eag Sh animals expressing Mad1 (eag Sh, ELAV-GS > Mad1; eag1 Sh120/Y; UAS-Mad1/+; UAS-Mad1/ELAV-GS-GAL4) with and without RU-486 is also shown. **p < 0.005. An alternative explanation for these data is that BMP signaling mutations suppress activity despite the eag Sh mutations or high-temperature rearing. Physiological recordings from body wall muscles, however, showed that BMP pathway mutations did not suppress eag Sh-induced neuronal hyperactivity. The muscles of eag Sh;; wit and eag Sh; gbb larvae exhibited spontaneous synaptic depolarizations that were as frequent as in eag Sh (Fig. 5a,b; eag Sh vs eag Sh;; wit p = 0.21, eag Sh vs eag Sh; gbb p = 0.43). The amplitude of the activity was nevertheless smaller than in eag Sh (eag Sh vs eag Sh;; wit p < 10−5, eag Sh vs eag Sh; gbb p < 10−5). wit mutations also blocked a temperature-induced increase in EJP size from the large, type IB boutons, which is quite robust in the WT (Sigrist et al., 2003; Zhong and Wu, 2004; Fig. 5c–e) (mf 12, IB, mean ± SEM, mV; WT22: 9.58 ± 0.85, WT30: 15.2 ± 1.67, p = 0.008; wit22: 4.90 ± 0.14, wit30: 3.98 ± 0.85, p = 0.20). The size of mEJPs was unaltered (Fig. 5d), and their frequency was unaffected (data not shown), consistent with a presynaptic effect on the quantal content of glutamate release (Fig. 5e). Therefore, without BMP signaling, neither morphological nor physiological plasticity is possible at the Drosophila NMJ, and we conclude that the loss of activity-dependent plasticity in BMP signaling mutants is not a secondary effect of reduced membrane excitability. BMP pathway mutations block the activity-dependent modulation of synaptic transmission without suppressing hyperexcitability. a, Intracellular records of spontaneous synaptic depolarizations in mf 12 from third instar larvae, recorded at 22°C in 1 mm Ca2+ saline. a1, Records from WT, wit (witA12/witB11), and gbb (gbb1/gbb2). a2, Records from eag Sh (eag1 Sh120), eag Sh;; wit (eag1 Sh120;; witA12/witG15), and eag Sh; gbb (eag1 Sh120; gbb1/gbb2). The activity in eag Sh mutants has been previously shown to be blocked by TTX (Ganetzky and Wu, 1982) and is the result of motoneuron action potential activity. All spontaneous activity was recorded for at least 10 s, and recordings were performed after cutting the peripheral nerve close to the ventral ganglia. b, The frequency of spontaneous synaptic activity in the corresponding genotypes shown in a. BMP mutations do not significantly impact the frequency of spontaneous synaptic activity in eag Sh. c, EJPs recorded from WT and wit (witA12/witB11) animals reared at 22°C and 30°C. The type IB motoneuron (IB) EJP was separated from the summed type IB and IS (IS+B) EJP by control of the stimulus amplitude and duration. The IB and IS motoneuron axons differ in diameter and exhibit differential action potential thresholds during extracellular stimulation; 22°C (room temperature); 1 mm Ca2+. d, Amplitude distribution of mEJPs from WT and wit reared at 22°C (white bars) and 30°C (gray bars); WT22°C, N = 16 animals; WT30°C, N = 5; wit22°C, N = 6; wit30°C, N = 13. Bin size, 0.2 mV. Arrows indicate the mean mEJP amplitudes, which were not statistically different. e, Quantal content is shown for the IB terminal as defined by the ratio of EJP/mEJP (WT22°C, n = 13; WT30°C, n = 5; wit22°C, n = 5; wit30°C, n = 7). *p < 0.05. Our results are consistent with a model where retrograde BMP signaling switches on developmental programs that enable activity-dependent NMJ growth. This is in contrast to situations where the level of BMP signaling determines the amount of NMJ growth and plasticity. To distinguish between these scenarios, we tested whether there is a synergistic relationship between the level of BMP signaling and NMJ activity. We used two constitutively active variants of the type I BMP receptor (Saxophone, SaxAct or Thickveins, TkvAct) at gene dosages that by themselves do not lead to NMJ expansion (McCabe et al., 2004; Collins et al., 2006). These transgenes were combined with a mutation (ShM) or a rearing condition (25°C) that moderately elevate neural activity, but also do not expand the NMJ (Budnik et al., 1990; Zhong and Wu, 2004). We found no evidence of synergy between elevated BMP activity and neural activity with respect to NMJ growth. Third instar ShM motoneurons expressing SaxAct or TkvAct formed NMJs similar in size to those of ShM mutants. Similarly, larvae reared at 25°C in combination with SaxAct or TkvAct expression had WT-sized NMJs (Fig. 6b). Elevating activity to a higher level, using the hyperactive eag Sh mutation, still did not yield a synergistic interaction with TkvAct (Fig. 6b, last two bars). Activity and BMP signaling do not synergize to enhance NMJ size. a, Diagram showing the BMP receptor complex at the motoneuron bouton membrane, composed of the type II BMP receptor Wit and either of the two type I BMP receptors, Saxophone and Thick veins. Constitutively active Saxaphone (SaxACT) and Thick veins (TkvAACT) receptors phosphorylate Mad (pMad) independent of binding by the Gbb ligand, leading to elevated pMad at the motoneuron nucleus. b, The number of boutons on mfs 7/6 after presynaptic expression of SaxACT or TkvACT at 22°C, at 25°C, and in a Sh or eag Sh mutant background. The genotypes are as follows: Elav > SaxACT (ELAVc155-GAL4/Y; UAS-SaxACT), ELAV > TkvACT (ELAVc155-GAL4/Y; UAS-TkvACT/+), Sh background (ShM, ELAVC155-GAL4/Y; UAS-SaxACT or UAS-TkvACT/+), and eag Sh, ELAV > TkvACT + (eag1 Sh120/Y; UAS-TkvACT/+; ELAV-GS-GAL4/+). These animals were grown in the absence (−RU) or presence (+RU) of RU-486. The lower dashed line represents the mean NMJ size in the GAL4 (w, ELAVC155-GAL4) and UAS (yw, UAS-SaxACT and yw, UAS-TkvACT) controls as well as in ShM, ELAVC155-GAL4 and the WT. The upper dashed line represents the mean synaptic size in eag Sh and in WT animals grown at 30°C. c, The number of boutons on mfs 7/6 in eag1 Sh120/Y; UAS-Mad1/+; UAS-Mad1/ELAV-GS-GAL4 animals grown without and with RU-486 throughout development. Also shown is the number of boutons in this genotype after RU-486 induction of Mad1 at all stages of development except during L1 or only during L1. +, induction with RU-486; −, no induction. *p < 0.05. **p < 0.005. Finally, we determined at what stage of development Mad signaling is required for activity-dependent NMJ expansion. Hyperactive NMJs showed a very robust NMJ expansion when the dominant-negative Mad1 transgene was expressed in neurons at all developmental stages except L1 (Fig. 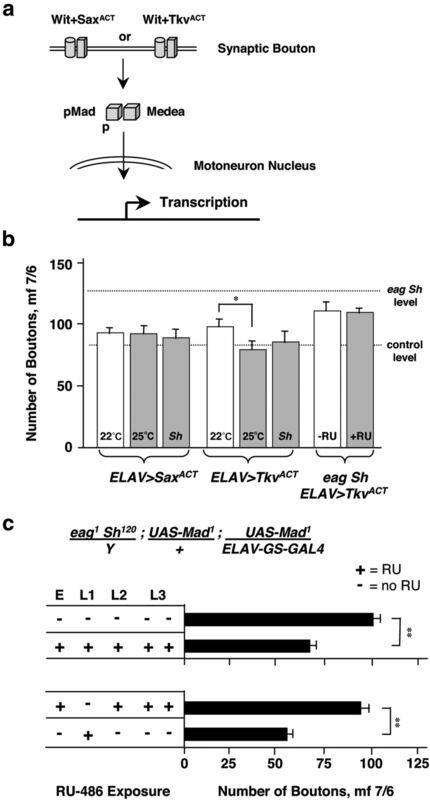 6c; ELAV > Mad1 +RU (E, L2, L3) in eag Sh: 96.2 ± 5.4; ELAV > Mad1 +RU (E, L2, L3): 70.9 ± 3.6, p < 0.05), whereas Mad1 expression during L1 suppressed growth plasticity as strongly as when it was expressed throughout development (Fig. 6c, compare bars 2 and 4). This indicates that there is an early critical or sensitive period during L1 when Mad signaling is necessary and sufficient to permit activity-dependent plasticity. We next hypothesized that one or more of Mad's downstream effector genes may regulate activity-dependent NMJ growth. Several molecules have been extensively examined for their role in activity-dependent plasticity at the NMJ (Table 1), including the IgCAM Fasciclin-2 (Fas2), the adenylyl cyclase Rutabaga (Rut), and the transcriptional regulators AP-1 and cAMP-CREB (Zhong et al., 1992; Davis et al., 1996; Schuster et al., 1996a, b; Davis and Goodman, 1998; Sanyal et al., 2002, 2003; Zhong and Wu, 2004). We also evaluated a potential role for Neurexin, as its elevated expression expands the NMJ, whereas neurexin mutants show abnormal separations between the presynaptic and postsynaptic membranes, similar to wit (Li et al., 2007; Banovic et al., 2010). Last, we examined a role for the RPTP Lar because its level of expression correlates with the number of synaptic boutons (Kaufmann et al., 2002), as if Lar acts as a “gain controller” for NMJ growth. We tested each of these candidate genes in combination with Mad1 to determine whether they could expand the NMJ in the absence of canonical BMP-dependent transcription. As previously reported, decreased Fas2 or increased cAMP or AP-1 levels expanded the NMJ when BMP signaling was intact (Table 1). Nevertheless, these growth-enhancing effects were blocked by Mad1 expression (Table 1). Similarly, overexpression of Neurexin together with Mad1 produced a small NMJ (Table 1) (ELAV > Neurexin+Mad1 −RU vs ELAV > Neurexin+Mad1 +RU, p < 0.05; ELAV > Mad1 vs ELAV > Neurexin+Mad1, p = 0.09). Thus, although these diverse molecules can influence NMJ expansion, in every case they depend on other genes downstream of the canonical BMP pathway to achieve their effects. By contrast, neuronal expression of the RPTP Lar was sufficient to restore NMJ growth and plasticity despite Mad1 expression. As previously shown (Kaufmann et al., 2002), heteroallelic Lar mutations (Lar5.5/Lar13.2) reduce synaptic size (see Fig. 8b, compare bars 1 and 3), whereas overexpression of full-length Lar had the opposite effect (control: 72 ± 4; Lar gain of function: 105 ± 5; p = 0.0002). Neuronal overexpression of Lar fully rescued the effects of Mad1 expression (Table 1; p = 0.24), whereas a phosphatase-dead form of Lar was less effective (Fig. 7a, p = 0.006), indicating the partial restoration of NMJ growth despite dependence on Lar's phosphatase activity. The receptor protein tyrosine phosphatase Lar rescues the growth defects caused by Mad1, but Lar expression is independent of BMP signaling. a, Increased expression of Lar restores normal NMJ size despite the inhibition of Mad signaling. The number of boutons on mf 7/6 in third instar larvae are shown. RU-486 induction was throughout development. The first two bars compare the number of synaptic boutons with or without the induced expression of the Mad1 transgene in neurons (ELAV > Mad1; w; UAS-Mad1/+; ELAV-GS-GAL4/+). The next two bars compare bouton numbers with or without induction of both Mad1 and Lar (ELAV > Mad1, Lar; w; UAS-Mad1/+; ELAV-GS-GAL4/UAS-Lar). Induced expression of Lar restores NMJ size despite the presence of Mad1 to suppress BMP signaling. The next two bars show the same experiment done with a phosphatase-dead version of Lar (dead) (ELAV > Mad1, Lar(dead); w; UAS-Mad1/+; ELAV-GS-GAL4/UAS-LarC1638S+C1929S). The partial rescue suggests that Lar localization and its catalytic activity are both involved in the rescue of the NMJ growth phenotype. b, qPCR analysis of Lar transcripts isolated from the third instar CNS of WT, wit (witA12/witB11), and ELAV-GS > Mad1 (yw; UAS-Mad1; ELAV-GS-GAL4) reared in the presence (RU+) and absence (−RU) of RU-486. Lar transcript levels remain unaffected by either wit mutations or by the induced expression of the Mad1 transgene. c, Bouton counts on mf 7 and 6 in Lar mutant animals rescued by RU-486 induced expression of Lar at different stages of development. The first bar represents NMJ size in the absence of Lar induction. The black arrowhead indicates the average bouton count for the Lar13.3/Lar5.5 mutant. The second bar represents the effect of inducing the expression of Lar throughout development, which strongly rescues the growth defects in Lar mutants. White arrowhead indicates the average bouton count for WT NMJs. The third and fourth bars show that induction of Lar in neither early stages (E and L1, bar 3) nor late stages (L2 and L3, bar 4) could rescue the Lar mutations. *p < 0.05. **p < 0.005. n.s., Not significant. To further investigate the relationship between Mad and Lar during NMJ growth, we examined how mutations of each affected the expression of the other. We found that pMad immunofluorescence was present in Lar mutant motoneuron nuclei, showing that Lar function is not critically required for either Mad expression or its activation. We also found that the level of Lar transcript within the third instar CNS was unchanged in either wit mutants or after expression of Mad1, as assessed by qPCR (Fig. 7b). We next examined when Lar function is required during development: the phenocritical rescue of Lar mutants (Fig. 7c) shows that neither early (E,L1) nor late (L2,L3) expression alone is sufficient to restore NMJ growth in Lar mutants, indicating that unlike BMP mutants which have an early requirement for growth, Lar is required throughout development. As might be expected for an effector of BMP-dependent synaptic plasticity, Lar is required for activity-dependent NMJ growth. The small synapses in Lar mutants were unaffected by eag Sh (Fig. 8a,b) or by high-temperature rearing (Fig. 8b, Lar vs eag Sh; Lar, p = 0.21; Lar vs Lar 30°C, p = 0.37). Presynaptic expression of Lar in an eag Sh, ELAV > Mad1 background also restored activity-dependent NMJ expansion (Fig. 8c). The synapses of these animals were similar in size to those of eag Sh (p = 0.07) and were significantly larger than WT NMJs coexpressing Mad1 and Lar (p < 10−5). In conclusion, the NMJ growth defects associated with disruption of Mad signaling can be rescued with elevated Lar expression in presynaptic motoneurons. This indicates that Lar acts either in parallel to BMP signaling or that BMP signaling regulates Lar function in a transcription-independent manner. Lar is required for synaptic plasticity at the Drosophila neuromuscular junction. a, NMJs on mf 7/6 of third instar larvae in eag Sh (eag1 Sh120) and eag Sh;; Lar (eag1 Sh120/Y; Lar5.5/Lar13.2) triple mutants. Scale bar, 25 μm. b, NMJ expansion resulting from elevated temperature rearing or eag Sh hyperactivity depends on Lar function. The number of boutons in WT and Lar (Lar5.5/Lar13.2) animals reared at 22°C and 30°C, and in hyperactive eag Sh and eag Sh;; Lar animals. c, The number of boutons in eag Sh animals expressing Mad1 (eag Sh, ELAV > Mad1; eag1 Sh120; UAS-Mad1/+; ELAV-GS-GAL4/+) and coexpressing Mad1 and Lar (eag Sh, ELAV > Mad1, Lar; eag1 Sh120; UAS-Mad1/+; ELAV-GS-GAL4/UAS-Lar) with (+RU) and without (−RU) RU-486. Lar function is sufficient to permit synaptic expansion in the presence of elevated NMJ activity, even with suppressed BMP signaling due to coexpression of Mad1. **p < 0.005. n.s., Not significant. Despite our observation that BMP signaling is necessary and sufficient for NMJ growth only during L1, levels of pMad within motoneuron nuclei remain high throughout larval life (Fig. 2c) (Collins et al., 2006; Wang et al., 2007). To address potential roles for nuclear pMad during the later stages of development, we characterized when Mad signaling regulates NMJ physiology. BMP signaling mutations have striking effects on neurotransmission in addition to defects in synaptic growth. BMP mutants have smaller EJPs from both the small (IS) and large (IB) type I boutons and a reduced quantal content, and nearly all also show a lower frequency of spontaneous mEJPs (Aberle et al., 2002; Marqués et al., 2002; McCabe et al., 2003). We first confirmed that presynaptic expression of Mad1 phenocopied the physiological defects observed in mad mutants (McCabe et al., 2004). Using the GeneSwitch system and RU-486 exposure to express Mad1 throughout development, we observed a decrease in EJP size in mf 12, without an alteration in mEJP amplitude, consistent with a reduced quantal content (Fig. 9, compare the black and white bars). When Mad1 was expressed during the early critical period (E and L1) but not afterward (L2 and L3), EJPs were intermediate in size (Fig. 9a), mEJP amplitudes were unchanged (Fig. 9c; mf 12, mV; ELAV > Mad1 −RU: 0.75 ± 0.20, ELAV > Mad1 +RU: 0.64 ± 0.19, ELAV > Mad1 +RU(E,L1): 0.69 ± 0.19), and the quantal content was significantly reduced for the type IB synapse (Fig. 9d). Animals with Mad1 induction only during the E and L1 stages had small-sized NMJs (Fig. 1b, bar 7), yet despite this had EJP amplitudes and the frequencies of spontaneous release that were larger than in animals with Mad1 induced throughout larval development. The absence of Mad1 induction during L2 and L3 appears to have enabled these physiological properties to recover to the WT level, as if Mad-dependent signaling effectively promotes physiological function at stages after the L1-sensitive period for NMJ growth. To test this, we induced Mad1 during L2 and L3 and examined synaptic physiology at the NMJs of control and experimental animals that had comparable numbers of boutons (mf 12; ELAV > Mad1 −RU: 120.9 ± 9.3; ELAV > Mad1 +RU (L2,L3): 119.3 ± 6.8). 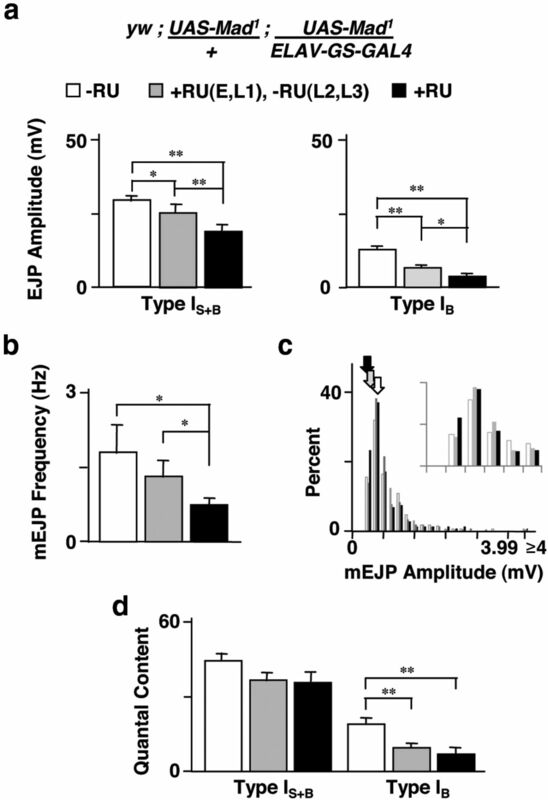 Significantly, the late induction of Mad1 reduced the amplitude of evoked EJPs and the frequency of mEJPs (Fig. 10). EJPs from both IB and IS boutons on mf 12 were significantly reduced compared with EJPs in controls without RU-486 exposure. As the amplitude of mEJPs remained unaltered (Fig. 10d; mV; ELAV > Mad1 −RU: 0.75 ± 0.20; ELAV > Mad1 +RU(L2,L3): 0.65 ± 0.20), these results again indicated a reduction in quantal content for the IB synapse (Fig. 10e). Thus, BMP signaling is required throughout development for normal synaptic physiology, in contrast to the early requirement of BMP signaling for NMJ growth. Canonical BMP signaling throughout larval development regulates neurotransmitter release at the NMJ. a, EJP amplitudes from type IS+B and IB synapses in yw; UAS-Mad1/+; UAS-Mad1/ELAV-GS-GAL4 animals with induced expression of Mad1. Black bars, RU-486 induced expression throughout embryonic and larval development: +RU. Gray bars, induced expression only during E and L1, but not L2 and L3: +RU (E, L1), −RU (L2,L3). White bars, no RU-486 induction: −RU. n = 7 larvae for +RU, n = 6 for +RU (E, L1), −RU (L2,L3), and n = 7 for +RU. b, The frequency of spontaneous mEJPs resulting from the induced expression of Mad1, as indicated in a; n = 7 larvae for +RU, n = 7 for +RU (E, L1), −RU (L2,L3), and n = 7 for +RU. c, Amplitude distribution of mEJPs resulting from the induced expression of Mad1, as indicated in a. Bin size, 0.2 mV. A separate bin is shown for the rare cases of amplitudes ≥4.0 mV. Arrows indicate the mean mEJP amplitude for each condition, which did not differ significantly. The first 5 bins are also shown at high magnification (inset). d, Quantal content computed for both the IS+B terminals and for the IB terminal by taking the ratio of the mean EJP amplitude/mean mEJP amplitude. Mad signaling during late larval stages is required for normal neurotransmission and active zone morphology. a, Evoked EJPs from IS+B and IB synapses of yw; UAS-Mad1/+; UAS-Mad1/ELAV-GS-GAL4 in animals without induction of Mad1 (−RU) or with RU-486 induction during L2 and L3 [+RU (L2, L3)]. Recordings obtained from mf 12 at 22°C (room temperature) in 1 mm Ca2+. b, EJP amplitudes compared between −RU (white bar) and +RU (L2, L3) conditions (gray bar); n = 7 larvae for −RU, n = 6 for +RU (L2, L3). c, The frequency of spontaneous mEJPs recorded from the same induction conditions as in b; n = 7 larvae for −RU, n = 6 for +RU (L2, L3). d, Size distribution of mEJP amplitude. Bin size, 0.2 mV. A separate bin is shown for the rare cases of amplitudes ≥4.0 mV. Arrows indicate the mean mEJP amplitudes, which did not differ significantly. e, Quantal content computed for the combined IS+B terminals and for the IB terminal as the mean EJP amplitude/mean mEJP amplitude; n = 7 larvae for −RU, n = 6 for +RU (L2, L3). f, Immunolabeling of Bruchpilot, a protein associated with active zones. Bruchpilot appears as multiple punctae within synaptic boutons. Shown are the terminal two IB boutons from a mf 12 NMJ branch, from a −RU and a +RU (L2, L3) third instar larvae. Scale bar, 2 μm. g, The average number of Bruchpilot-positive punctae per bouton in the terminal two IB boutons of mf 12 NMJ branches of −RU and +RU (L2, L3) third instar larvae, as well as the average diameter of the labeled punctae. **p < 0.005. The decrease in mEJP frequency and reduction in quantal content by Mad1 expression might be due to active zone defects. wit, gbb, and mad mutations show fewer release sites per bouton, but these active zones are abnormally enlarged (Aberle et al., 2002; Marqués et al., 2002; McCabe et al., 2003, 2004). We examined putative active zones by visualizing Bruchpilot (Brp), an ELKS/CAST/ERC active zone-associated protein (Wagh et al., 2006) within the terminal type IB boutons on mf 12. Brp labeling appeared as numerous distinct, fluorescent punctae. Induction of Mad1 late in larval development (L2 and L3) reduced the number and increased the size of these punctae (Fig. 10f,g). A defect in active zone size has also been documented in Lar mutants (Kaufmann et al., 2002), suggesting that Lar may be involved in BMP-dependent regulation of neurotransmission. However, coexpression of Mad1 and Lar reduced the amplitude of synaptic potentials similar to those of Mad1 alone (mf 6, mean ± SEM, mV; IB synapse; ELAV > Mad1 +RU: 12.32 ± 0.39; ELAV > Mad1 +Lar +RU: 12.86 ± 0.60, p = 0.49; IS+B; ELAV > Mad1 +RU: 22.01 ± 0.5; ELAV > Mad1+Lar +RU: 22.69 ± 1.22, p = 0.62; n ≥ 6). The frequency of spontaneous mEJPs was also not rescued (mean ± SEM, Hz; ELAV > Mad1 +RU: 1.03 ± 0.20; ELAV > Mad1+Lar+RU: 1.18 ± 0.20, p = 0.61). Our results therefore support the idea that Mad signals throughout development to influence neurotransmission at the NMJ and that the Lar RPTP may not be integral for Mad's effects on synaptic physiology. We have investigated how retrograde BMP signaling by Gbb, Wit, and Mad influences the development of the Drosophila NMJ. Our experiments examined the timing of retrograde signaling and the relationship between BMP signaling and the activity-dependent modulation of NMJ development. The results indicate that an early and transient period of BMP signaling, acting through Mad, activates key developmental programs necessary for synapse maturation. Transcriptional regulation by Mad in the first larval instar (L1, 24 h) is necessary and sufficient for robust NMJ growth during the second (L2) and third (L3) instars (72 h). Mad signaling during L1 also allows activity to enhance the growth process. By contrast, Mad signaling in L1 through L3 is required for normal active zone morphology and the developmental increase in quantal content. Our results therefore indicate that retrograde BMP signaling “gates” NMJ development and plasticity by initiating two genetically separable programs for growth and physiology. In the absence of retrograde BMP signaling, the NMJ shows only residual growth, forming weak connections that are insensitive to activity-dependent modulation. BMP signaling mutations do not disrupt axonal guidance, target selection, or the initiation of synaptogenesis. They instead have profound effects on later aspects of synaptic development, affecting NMJ expansion and bouton stabilization (Aberle et al., 2002; Marqués et al., 2002; McCabe et al., 2003, 2004; Rawson et al., 2003; Eaton and Davis, 2005; Goold and Davis, 2007). We found that expression of Mad1, the protein encoded by the strong dominant-negative mad1 allele, phenocopies BMP signaling mutants (see Materials and Methods), affecting both NMJ growth (Fig. 1b, bars 1 and 2) and physiology (Fig. 9). By driving Mad1 expression at various times during development, we found that Mad-dependent signaling during L1 is both necessary and sufficient for subsequent NMJ growth. Our results are consistent with an L1 critical period for BMP signaling. Inducing Mad1 expression at all times except L1 produced a WT-sized NMJ, whereas induction only during L1 reduced NMJ size to that seen in mad mutants (Fig. 1, bars 9 and 10). The genetic rescue of gbb and wit mutants also revealed the importance of the retrograde BMP pathway signaling during embryogenesis and L1 (Figs. 2a and 3). The timing of retrograde BMP signaling, after synaptogenesis yet before growth commences, suggests a model where the muscle uses BMP signaling to inform the motoneuron nucleus of a successfully formed synapse, activating subsequent growth and plasticity programs. The exact timing of this critical period, however, requires knowing when the Mad1 transgene inhibits transcription of Mad's major effectors of NMJ growth, which are unknown. Our data indicate that a 24 h exposure to RU-486 during L1 expresses enough Mad1 to suppress NMJ growth (Fig. 1, bar 10). It also suggests that the perdurance of the dominant negative plus the time needed for its activation must be less than 24 h, as expression during embryogenesis, L2, and L3 led to NMJs that were nearly WT in size (Fig. 1, bar 9). Therefore, although the critical period may be shifted later in development than our data indicate, it is likely to begin as early as 5 h after the onset of L1. Our data provide an entrance into the mechanisms regulating the critical period. Based on its timing between the embryonic and L2 stages, it is possible that molting hormones influence Mad activity (Miller et al., 2012). Recent work also indicates that anterograde activin signaling induces Gbb expression in body wall muscles (Ellis et al., 2010), whereas postsynaptic dCIP4 signaling (Drosophila Cdc42 Interacting Protein 4) and the activity of dRich, a conserved Cdc 42-selective guanosine triphosphatase-activating protein, inhibits Gbb secretion from these muscles (Nahm et al., 2010a, b). Furthermore, the secretion of a TGF-β ligand (Maverick) from peripheral glia strongly regulates Gbb signaling from the postsynaptic muscle, affecting both pMad levels within motoneurons and NMJ growth (Fuentes-Medel et al., 2012). It would therefore be interesting to perform phenocritical analyses on activin, dCIP4, dRich, and Maverick and to address whether postsynaptic depolarization influences the activity of dCIP4 or dRich. Our genetic interaction experiments found no evidence to suggest that moderate increases in BMP signaling modulate the final size of the NMJ or synergize with presynaptic activity. Our findings of an early critical period for NMJ growth differ slightly from a previous study, which overexpressed an inhibitory SMAD (Goold and Davis, 2007). In an effort to reconcile our results with these earlier data, we transiently expressed Dad during L1 but found no alteration in NMJ size (data not shown), perhaps resulting from different mechanisms of BMP pathway inhibition. An unexpected result from our study is that the early BMP signal is necessary and sufficient for subsequent growth and structural plasticity, but not for synaptic function. In the absence of later BMP signaling, the NMJ grows to its structurally normal size but has reduced neurotransmission. The later requirement for BMP signaling is consistent with the observation that pMad levels remain high in motoneuron nuclei throughout larval development. In the absence of continual Mad activity, the number of active zones is reduced and their size is aberrantly enlarged (Fig. 10). The separable roles of BMP signaling for NMJ growth and function are also consistent with the distinct actions of the two known targets of retrograde BMP signaling in motoneurons, Trio and Twit (Ball et al., 2010; Kim and Marqués, 2012). We do not know whether the active zone phenotype arising from the loss of BMP signaling late in development results from defects in the formation or the maintenance of these structures. The active zone protein dSyd and the Teneurin-a adhesion molecule are potentially involved in Mad's physiological program, as their loss causes physiological and ultrastructural phenotypes that overlap with those of BMP mutants (Owald et al., 2010; Mosca et al., 2012). Future studies of how Mad simultaneously and separately regulates NMJ growth and physiology could lead to a deeper understanding of how dSyd and Teneurin-a might act dowstream of Mad. The separable downstream effects of Mad on growth versus physiology may depend on post-translational modifications that can occur at the linker between the MH1 and MH2 domains, changes that can affect the affinity of Mad's binding partners (Chen et al., 2006; Knockaert et al., 2006; Blitz and Cho, 2009). Unfortunately, Mad's noncanonical binding partners in motoneurons are entirely uncharacterized. 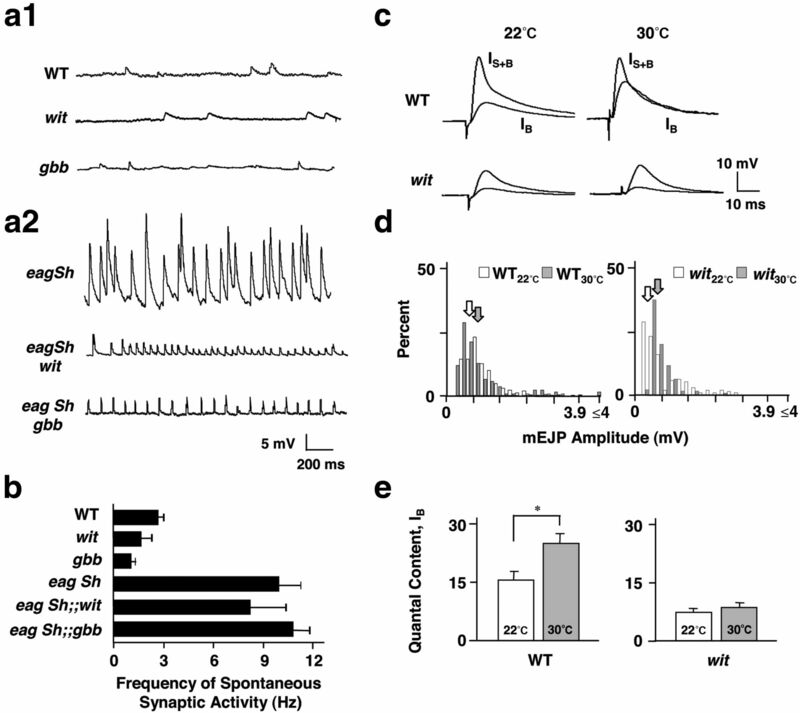 Elevated action potential firing in motoneurons resulting from the loss of repolarizing K+ channels or by high-temperature rearing substantially enhances NMJ growth and synaptic transmission (Budnik et al., 1990; Davis et al., 1996; Schuster et al., 1996b; Zhong and Wu, 2004; Mosca et al., 2005). Mutations affecting the BMP signaling pathway block this plasticity (Fig. 4) without suppressing presynaptic hyperactivity (Fig. 5). Our results indicate that retrograde BMP signaling allows motoneuron growth to be responsive to increased levels of activity. Indeed, the level of excitability during Mad's critical period for growth strongly affected synaptic size in mature larvae (compare Fig. 1, bar 9 with Fig. 6c, bar 3). Understanding how this early activity engages BMP-dependent programs could be very insightful given that cAMP, AP-1, and Fas-2 signaling failed to rescue the effects of Mad1 expression (Table 1). Instead, the receptor protein tyrosine phosphatase Lar rescued both normal and activity-dependent NMJ growth (Figs. 7a and 8c), and Lar was required for activity-dependent developmental plasticity (Fig. 8a,b). Lar family members are essential, well-conserved regulators of synaptogenesis from worms and flies to mammals (Van Vactor et al., 2006). Despite the prior identification of extracellular ligands for Lar family RPTPs, there has been no significant insight into the temporal regulation of Lar signaling during synaptogenesis in any system. Current evidence suggests that the Lar pathway regulates cytoskeletal assembly and active zone formation (Kaufmann et al., 2002; Johnson and Van Vactor, 2003; Johnson et al., 2006) while antagonizing the activity of the highly conserved Abelson (Abl) tyrosine kinase (Wills et al., 1999). At the larval stage, Abl negatively regulates NMJ size (Lin et al., 2009) and abl mutations have phenotypes reciprocal to those of Lar. Lar may relieve the growth-inhibitory action of Abl, promoting synaptic expansion in response to elevated activity or postsynaptic growth. Lar acts via the actin-modulating protein Ena for NMJ growth (D.L.V.V., personal communication), whereas Trio and Lar regulate growth and the presynaptic cytoskeleton by interacting with Diaphanous, a member of the formin family of proteins (Pawson et al., 2008). As Trio levels are reduced in BMP mutants and the expression of Trio only partially rescues NMJ growth (Ball et al., 2010), it is possible that Ena or Diaphanous act independently of Mad signaling. In the absence of BMP signaling, the small NMJs can be genetically rescued by increased expression of Lar. This suggests that reduced BMP signaling in some fashion reduces Lar activity or function at the NMJ. Our qPCR analyses show that Lar transcript levels remain normal despite reduced pMad activity (Fig. 7b), leaving open the possibility that post-transcriptional mechanisms reduce Lar expression, NMJ localization, or activity, either by changes to the receptor itself, to Lar's binding partners (for e.g., Liprins), or to the heparin sulfate proteoglycan ligands. Our observations support a model where retrograde BMP signaling allows synaptic growth to be modulated by neural activity, with Lar acting as the downstream “gain controller” to establish the specific level of synaptic efficacy. In this model, postsynaptic BMP release initiates competence of the presynaptic terminal to respond to the matrix via Lar. Lar's heparin sulfate proteoglycan ligands and its anchoring proteins (Liprins) (Kaufmann et al., 2002; Astigarraga et al., 2010) might then provide spatial information or couple Lar function to synaptic activity. Heparin sulfate proteoglycans play important roles during critical periods (Hensch, 2004), and they modulate the signaling of BMPs, Wnts, and fibroblast growth factors (Van Vactor et al., 2006). It is therefore possible that the extracellular matrix provides a key integrator that coordinates multiple trans-synaptic signals in a developmental and activity-dependent manner (Dani et al., 2012). This work was supported by the National Institutes of Health Grants 5R01NS031651 and 1R21NS053807 to H.K., the National Science Foundation (IBN 0641915), and National Institute of Neurological Disorders and Stroke Grant P01 NS066888 to D.L.V.V. We thank M. O'Connor, M. Bhat, S. Sanyal, K. Wharton, S. Selleck, D. Allen, K. O'Connor-Giles, P. ten Dijke, G. Marqués, and the Bloomington Stock Center for generously providing Drosophila stocks, reagents, and protocols; and R. Wyman, W. Zhong, M. Garcia-Castro, and members of the H.K. and D.L.V.V. laboratories for their advice and comments on the manuscript. (2002) wishful thinking encodes a BMP type II receptor that regulates synaptic growth in Drosophila. Neuron 33:545–558, doi:10.1016/S0896-6273(02)00589-5, pmid:11856529. (2003) Specification of neuropeptide cell identity by the integration of retrograde BMP signaling and a combinatorial transcription factor code. Cell 113:73–86, doi:10.1016/S0092-8674(03)00204-6, pmid:12679036. (2005) Fasciclin II signals new synapse formation through amyloid precursor protein and the scaffolding protein dX11/Mint. J Neurosci 25:5943–5955, doi:10.1523/JNEUROSCI.1144-05.2005, pmid:15976083. (2010) Three Drosophila liprins interact to control synapse formation. J Neurosci 30:15358–15368, doi:10.1523/JNEUROSCI.1862-10.2010, pmid:21084592. (1999) BMPs as mediators of roof plate repulsion of commissural neurons. Neuron 24:127–141, doi:10.1016/S0896-6273(00)80827-2, pmid:10677032. (2004) Synaptic strengthening mediated by bone morphogenetic protein-dependent retrograde signaling in the Drosophila CNS. J Neurosci 24:6904–6911, doi:10.1523/JNEUROSCI.1978-04.2004, pmid:15295025. (2010) Retrograde BMP signaling controls synaptic growth at the NMJ by regulating trio expression in motor neurons. Neuron 66:536–549, doi:10.1016/j.neuron.2010.04.011, pmid:20510858. (2010) Drosophila neuroligin 1 promotes growth and postsynaptic differentiation at glutamatergic neuromuscular junctions. Neuron 66:724–738, doi:10.1016/j.neuron.2010.05.020, pmid:20547130. (2009) Finding partners: how BMPs select their targets. Dev Dyn 238:1321–1331, doi:10.1002/dvdy.21984, pmid:19441058. (1993) Development of the embryonic neuromuscular synapse of Drosophila melanogaster. J Neurosci 13:144–166, pmid:8093713. (1990) Morphological plasticity of motor axons in Drosophila mutants with altered excitability. J Neurosci 10:3754–3768, pmid:1700086. (2006) Identification of phosphatases for Smad in the BMP/DPP pathway. Genes Dev 20:648–653, doi:10.1101/gad.1384706, pmid:16510868. (1999) Drosophila larval neuromuscular junction's responses to reduction of cAMP in the nervous system. J Neurobiol 40:1–13, doi:10.1002/(SICI)1097-4695(199907)40:1<1::AID-NEU1>3.0.CO%3B2-1, pmid:10398067. (2006) Highwire restrains synaptic growth by attenuating a MAP kinase signal. Neuron 51:57–69, doi:10.1016/j.neuron.2006.05.026, pmid:16815332. (2012) A targeted glycan-related gene screen reveals heparan sulfate proteoglycan sulfation regulates WNT and BMP trans-synaptic signaling. PLoS Genet 8:e1003031, doi:10.1371/journal.pgen.1003031, pmid:23144627. (1998) Synapse-specific control of synaptic efficacy at the terminals of a single neuron. Nature 392:82–86, doi:10.1038/32176, pmid:9510251. (1996) Genetic dissection of structural and functional components of synaptic plasticity: III. CREB is necessary for presynaptic functional plasticity. Neuron 17:669–679, doi:10.1016/S0896-6273(00)80199-3, pmid:8893024. (2009) Neuronal phenotype in the mature nervous system is maintained by persistent retrograde bone morphogenetic protein signaling. J Neurosci 29:3852–3864, doi:10.1523/JNEUROSCI.0213-09.2009, pmid:19321782. (2005) LIM Kinase1 controls synaptic stability downstream of the type II BMP receptor. Neuron 47:695–708, doi:10.1016/j.neuron.2005.08.010, pmid:16129399. (2010) Activin signaling functions upstream of Gbb to regulate synaptic growth at the Drosophila neuromuscular junction. Dev Biol 342:121–133, doi:10.1016/j.ydbio.2010.03.012, pmid:20346940. (2012) Integration of a retrograde signal during synapse formation by glia-secreted TGF-β ligand. Curr Biol 22:1831–1838, doi:10.1016/j.cub.2012.07.063, pmid:22959350. (1982) Drosophila mutants with opposing effects on nerve excitability: genetic and spatial interactions in repetitive firing. J Neurophysiol 47:501–514, pmid:6279790. (1983) Neurogenetic analysis of potassium currents in Drosophila: synergistic effects on neuromuscular transmission in double mutants. J Neurogenet 1:17–28, doi:10.3109/01677068309107069, pmid:6100303. (2007) The BMP ligand Gbb gates the expression of synaptic homeostasis independent of synaptic growth control. Neuron 56:109–123, doi:10.1016/j.neuron.2007.08.006, pmid:17920019. (1998) Synergistic signaling by two BMP ligands through the SAX and TKV receptors controls wing growth and patterning in Drosophila. Development 125:3977–3987, pmid:9735359. (2004) Critical period regulation. Annu Rev Neurosci 27:549–579, doi:10.1146/annurev.neuro.27.070203.144327, pmid:15217343. (2003) Receptor protein tyrosine phosphatases in nervous system development. Physiol Rev 83:1–24, doi:10.1152/physrev.00016.2002, pmid:12506125. (2006) The HSPGs Syndecan and Dallylike bind the receptor phosphatase LAR and exert distinct effects on synaptic development. Neuron 49:517–531, doi:10.1016/j.neuron.2006.01.026, pmid:16476662. (2002) Drosophila liprin-α and the receptor phosphatase Dlar control synapse morphogenesis. Neuron 34:27–38, doi:10.1016/S0896-6273(02)00643-8, pmid:11931739. (2004) Orchestrating development and function: retrograde BMP signaling in the Drosophila nervous system. Trends Neurosci 27:143–147, doi:10.1016/j.tins.2004.01.004, pmid:15036879. (1993) Cellular mechanisms governing synaptic development in Drosophila melanogaster. J Neurobiol 24:757–787, doi:10.1002/neu.480240606, pmid:8251016. (2012) The Ly6 neurotoxin-like molecule target of wit regulates spontaneous neurotransmitter release at the developing neuromuscular junction in Drosophila. Dev Neurobiol 72:1541–1558, doi:10.1002/dneu.22021, pmid:22467519. (2006) Unique players in the BMP pathway: small C-terminal domain phosphatases dephosphorylate Smad1 to attenuate BMP signaling. Proc Natl Acad Sci U S A 103:11940–11945, doi:10.1073/pnas.0605133103, pmid:16882717. (2007) Crucial role of Drosophila neurexin in proper active zone apposition to postsynaptic densities, synaptic growth, and synaptic transmission. Neuron 55:741–755, doi:10.1016/j.neuron.2007.08.002, pmid:17785181. (2009) Abi plays an opposing role to Abl in Drosophila axonogenesis and synaptogenesis. Development 136:3099–3107, doi:10.1242/dev.033324, pmid:19675132. (2001) Analysis of relative gene expression data using real-time quantitative PCR and the 2(-Delta Delta C(T)) Method. Methods 25:402–408, doi:10.1006/meth.2001.1262, pmid:11846609. (2005) Morphogens and synaptogenesis in Drosophila. J Neurobiol 64:417–434, doi:10.1002/neu.20165, pmid:16041756. (2002) The Drosophila BMP type II receptor Wishful Thinking regulates neuromuscular synapse morphology and function. Neuron 33:529–543, doi:10.1016/S0896-6273(02)00595-0, pmid:11856528. (2003) The BMP homolog Gbb provides a retrograde signal that regulates synaptic growth at the Drosophila neuromuscular junction. Neuron 39:241–254, doi:10.1016/S0896-6273(03)00426-4, pmid:12873382. (2004) Highwire regulates presynaptic BMP signaling essential for synaptic growth. Neuron 41:891–905, doi:10.1016/S0896-6273(04)00073-X, pmid:15046722. (2003) Spatiotemporal rescue of memory dysfunction in Drosophila. Science 302:1765–1768, doi:10.1126/science.1089035, pmid:14657498. (2004) Spatiotemporal gene expression targeting with the TARGET and gene-switch systems in Drosophila. Sci STKE 2004:pl6, doi:10.1126/stke.2202004pl6, pmid:14970377. (2012) Analysis of synaptic growth and function in Drosophila with an extended larval stage. J Neurosci 32:13776–13786, doi:10.1523/JNEUROSCI.0508-12.2012, pmid:23035089. (2002) Type I bone morphogenetic protein receptors are expressed on cerebellar granular neurons and a constitutively active form of the type IA receptor induces cerebellar abnormalities. Neuroscience 114:849–857, doi:10.1016/S0306-4522(02)00348-2, pmid:12379241. (2005) Dissection of synaptic excitability phenotypes using a dominant-negative Shaker K+ channel subunit. Proc Natl Acad Sci U S A 102:3477–3482, doi:10.1073/pnas.0406164102, pmid:15728380. (2012) Trans-synaptic Teneurin signalling in neuromuscular synapse organization and target choice. Nature 484:237–241, doi:10.1038/nature10923, pmid:22426000. (2010a) The Cdc42-selective GAP rich regulates postsynaptic development and retrograde BMP transsynaptic signaling. J Cell Biol 191:661–675, doi:10.1083/jcb.201007086, pmid:21041451. (2010b) dCIP4 (Drosophila Cdc42-interacting protein 4) restrains synaptic growth by inhibiting the secretion of the retrograde Glass bottom boat signal. J Neurosci 30:8138–8150, doi:10.1523/JNEUROSCI.0256-10.2010, pmid:20554864. (2008) Spatial and temporal control of gene expression in Drosophila using the inducible GeneSwitch GAL4 system. I. Screen for larval nervous system drivers. Genetics 178:215–234, doi:10.1534/genetics.107.081968, pmid:18202369. (2001) A conditional tissue-specific transgene expression system using inducible GAL4. Proc Natl Acad Sci U S A 98:12596–12601, doi:10.1073/pnas.221303298, pmid:11675495. (2010) A Syd-1 homologue regulates pre- and postsynaptic maturation in Drosophila. J Cell Biol 188:565–579, doi:10.1083/jcb.200908055, pmid:20176924. (2008) Formin-dependent synaptic growth: evidence that Dlar signals via Diaphanous to modulate synaptic actin and dynamic pioneer microtubules. J Neurosci 28:11111–11123, doi:10.1523/JNEUROSCI.0833-08.2008, pmid:18971454. (2007) Temperature-dependent developmental plasticity of Drosophila neurons: cell-autonomous roles of membrane excitability, Ca2+ influx, and cAMP signaling. J Neurosci 27:12611–12622, doi:10.1523/JNEUROSCI.2179-07.2007, pmid:18003840. (2001) Neurotrophins as synaptic modulators. Nat Rev Neurosci 2:24–32, doi:10.1038/35049004, pmid:11253356. (2003) Drosophila neuromuscular synapse assembly and function require the TGF-β type I receptor saxophone and the transcription factor Mad. J Neurobiol 55:134–150, doi:10.1002/neu.10189, pmid:12672013. (2006) Introduction on the use of the Drosophila embryonic/larval neuromuscular junction as a model system to study synapse development and function, and a brief summary of pathfinding and target recognition. Int Rev Neurobiol 75:1–31, doi:10.1016/S0074-7742(06)75001-2, pmid:17137921. (2002) AP-1 functions upstream of CREB to control synaptic plasticity in Drosophila. Nature 416:870–874, doi:10.1038/416870a, pmid:11976688. (2003) Evidence for cell autonomous AP1 function in regulation of Drosophila motor-neuron plasticity. BMC Neurosci 4:20, doi:10.1186/1471-2202-4-20, pmid:12969508. (1996a) Genetic dissection of structural and functional components of synaptic plasticity: II. Fasciclin II controls presynaptic structural plasticity. Neuron 17:655–667, doi:10.1016/S0896-6273(00)80198-1, pmid:8893023. (1996b) Genetic dissection of structural and functional components of synaptic plasticity: I. Fasciclin II controls synaptic stabilization and growth. Neuron 17:641–654, doi:10.1016/S0896-6273(00)80197-X, pmid:8893022. (2000) Synaptic ultrastructure in nerve terminals of Drosophila larvae overexpressing the learning gene dunce. J Neurobiol 43:89–97, doi:10.1002/(SICI)1097-4695(200004)43:1<89::AID-NEU8>3.0.CO%3B2-L, pmid:10756069. (2003) Experience-dependent strengthening of Drosophila neuromuscular junctions. J Neurosci 23:6546–6556, pmid:12878696. (2012) Relay of retrograde synaptogenic signals through axonal transport of BMP receptors. J Cell Sci 125:3752–3764, doi:10.1242/jcs.094292, pmid:22573823. (2005) DNA-binding domain mutations in SMAD genes yield dominant-negative proteins or a neomorphic protein that can activate WG target genes in Drosophila. Development 132:4883–4894, doi:10.1242/dev.02048, pmid:16192307. (2006) Heparan sulfate proteoglycans and the emergence of neuronal connectivity. Curr Opin Neurobiol 16:40–51, doi:10.1016/j.conb.2006.01.011, pmid:16417999. (2007) Drosophila spichthyin inhibits BMP signaling and regulates synaptic growth and axonal microtubules. Nat Neurosci 10:177–185, doi:10.1038/nn1841, pmid:17220882. (1999) Profilin and the Abl tyrosine kinase are required for motor axon outgrowth in the Drosophila embryo. Neuron 22:291–299, doi:10.1016/S0896-6273(00)81090-9, pmid:10069335. (2013) BMP signaling specifies the development of a large and fast CNS synapse. Nat Neurosci 16:856–864, doi:10.1038/nn.3414, pmid:23708139. (1998) Development of bone morphogenetic protein receptors in the nervous system and possible roles in regulating trkC expression. J Neurosci 18:3314–3326, pmid:9547239. (2004) Neuronal activity and adenylyl cyclase in environment-dependent plasticity of axonal outgrowth in Drosophila. J Neurosci 24:1439–1445, doi:10.1523/JNEUROSCI.0740-02.2004, pmid:14960616. (1992) Synaptic plasticity in Drosophila memory and hyperexcitable mutants: role of cAMP cascade. J Neurosci 12:644–651, pmid:1371316. (1999) Watching a synapse grow: noninvasive confocal imaging of synaptic growth in Drosophila. Neuron 22:719–729, doi:10.1016/S0896-6273(00)80731-X, pmid:10230792.